Net = media freedom for everyone. Article 19 of 1948 Universal Declaration of Human Rights = anti-fascist synthesis of liberal and socialist models of media freedom: formal right of all individuals -> substantive right of whole society. Pierre Teilhard de Chardin’s 1922 liberation theology: building heaven on earth = geosphere -> biosphere -> noosphere. Vannevar Bush’s 1945 New Deal modernism: Memex technology = mass production of information v. fragmentation of knowledge and enforced scarcity. Aksel Berg: 1917-1937 Left Bolshevik engineer -> 1937-40 Gulag prisoner -> 1953-7 USSR Deputy Defence Minister: bureaucratic Stalinism -> proletarian democracy = industrial socialism -> cybernetic communism. 1964 American Cybernetics Society: USA v. USSR ‘cybernetics gap’ -> 1968 JCR Licklider’s ‘Galactic Network’ -> 1969 ARPANET. Cold War McLuhanism: USA = prefiguring imaginary future of the information society in present. Vannevar Bush, As We May Think. Radovan Richta, Civilisation at the Crossroads. 1950s-2010s evolution of Net: military scientists-> academics -> hobbyists -> civil servants -> small businesses -> corporations -> everyone. Cold War American and Russian computer networks = command and control systems for fighting nuclear war. IBM = military-industrial complex of US computing: 1955 SAGE -> 1964 SABRE. 1962 Paul Baran of USAF’s RAND: On Distributed Communications = hierarchical centralised phone system -> horizontal decentralised Net. 1967 packet-switching -> 1969 ARPANET in USA -> 1973 Britain and Norway on Net -> 1973 Community Memory at Berkeley -> 1974 Ted Nelson’s Computer Lib -> 1979 Usenet -> 1979 MUDs at Essex University -> 1982 TCP/IP -> 1983 domain names -> 1983 Xanadu Project -> 1984 FidoNet -> 1986 NSFNet -> 1990 MILNET -> 1990 Tim Berners-Lee at CERN -> 1992 CERN browser-editor -> 1993 NCSA at University of Illinois’ Mosaic browser -> 1994 Netscape Navigator -> 1995 Netscape IPO -> 1995 Amazon and eBay -> 1996 Internet Explorer. 1993-2001 Bill Clinton = social liberal New Democrat US president. 1992 Al Gore speech: $120 billion ‘information superhighway’ = post-modern McLuhanist infrastructure for electronic marketplace of post-industrial future. 1994 Communications Act -> 1998 DMCA (Digital Millennium Copyright Act) = corporate media freedom imposed on Net. 1995 Bill Gates: Windows ’95 on PC -> interactive television of information superhighway. Microsoft Net = virtual shopping mall selling proprietary software and media. Katie Hafner and Matthew Lyon, Where Wizards Stay Up Late: the origins of the Internet. Edward Herman and Robert McChesney, The Global Media: The New Missionaries of Corporate Capitalism. Californian ideology = 1960s New Left electronic agora -> 1980s neo-liberal electronic marketplace. Stewart Brand and Kevin Kelly: 1968 Whole Earth Catalog -> 1974 CoEvolution Quarterly -> 1985 WELL -> 1993 Wired -> 1996 John Perry Barlow’s Declaration of Independence of Cyberspace: ‘Jeffersonian democracy’ = hippie neo-liberalism. New Left + New Right McLuhanism = anti-statism of anarchist activists -> market fundamentalism of dotcom entrepreneurs. 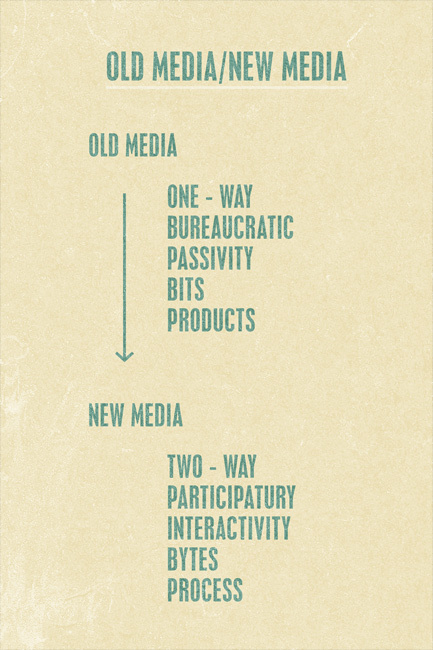 Old media = one-way passivity -> new media = two-way interactivity. The new class of the new = making new things in new ways with new technology: knowledge workers; hackers; symbolic analysts; netizens; digerati; immaterial labourers; digital citizens; swarm capitalists; bobos, and the creative class. Newt Gingrich, Nicholas Negroponte, George Gilder and Thomas Friedman: rapid spread of Net = inevitable triumph of US-dominated neo-liberal globalisation. Electronic marketplace in information: political media freedom = economic copyright censorship. Fred Turner, From Counterculture to Cyberculture. Peter Leyden, Peter Schwartz and Joel Hyatt, The Long Boom. 1991-2000: 107 months of economic growth = longest boom in US history. New information technologies = lowering inflation and raising productivity. Creative destruction of disruptive Net technology: ‘friction-free’ global electronic marketplace = perfect information for producers and consumers. B2B disintermedisation: GM TradeXchange = tyre prices down 10% and hoses 40%. Overhead costs for ticket from travel agent = $8 -> $1 on Net. Post-Fordist Net: just-in-time production, flexible labour and zero stocks. Amazon and eBay: e-commerce = first-mover advantage -> natural monopoly. Dotcom bubble = 1990s Net version of 1840s railway mania and 1920s radio speculation. 1998 irrational exuberance of Wall Street: Net stocks up 225% while Dow up 17%. 2000 AOL’s $164 billion take over of Time-Warner: old media -> new media. Competing on Internet time = Darwinian competition of technological innovation. 1995 Netscape = 90% of browsers -> 1998 Internet Explorer = 50% of browsers. 1997-2001 rise and fall of eToys.com: $80 -> 9¢. Implosion of dotcom bubble: cool idea -> VC funding -> media hype -> IPO -> ‘pump & dump’ -> fuckedcompany.com. Geoffrey Moore, Inside the Tornado. Esther Dyson, Release 2.0: a design for living in the digital age. Kevin Kelly, New Rules for the New Economy. Jonas Ridderstråle and Kjell Nordström, Funky Business: talent makes capital dance. ‘At the height of the Cold War, the US military created the only working model of communism in human history: the Net.’ – Richard Barbrook. Academic gift economy = presenting a paper and giving a journal article -> peer review = collective scientific progress by sharing research findings. Open standards and open architecture of Net = overcoming technical and economic barriers to communal knowledge -> ‘information wants to be free’. Scientists built Net by creating Net: emails, mailing lists and discussion groups. New Left Net: hacker ethic; IndyMedia; Anonymous; network communities and flash mobs. Third Way Net = Open Source Movement: 1991 Linux -> 1996 Apache -> 1998 Mozilla Foundation -> 2004 Firefox -> 2012 Firefox = 25% of browsers. Howard Rheingold, The Virtual Community. Eric Raymond, The Cathedral and the Bazaar. Michael Dertouzos of MIT Computer Science: media = 5% v. office work = 60% of US GNP in 1997. Kevin Kelly’s 7th new rule of new economy for swarm capitalists: ‘follow the free’. Hi-tech gift economy of Net = e-mail, websites, blogs, newsgroups and chatrooms -> decommodification of mass media. 1999 Napster = music piracy -> 2000 LimeWire = movie piracy -> 2001 BitTorrent = 40%-70% of Net traffic in 2009. Practical communism of Net: information abundance = sharing gifts not exchanging commodities. Participatory democracy of Net: user-generated content = DIY culture not media spectacle. Web 2.0: mixed economy of 2000s social media = corporate capitalist infrastructure for mass creativity. 1997 smart phones -> 500 million users in 2012. 2003 Skype -> 600 million users in 2012. 2004 Facebook -> 1 billion users 2012. 2006 Twitter -> 500 million users 2012. Hyper-reality of the Net: LOL cats; TMZ.com; Angry Birds; YouTube. ‘Slacktivism’ = slacker + activism of alter-globalisation Net protests. Virtual politics = post-modern passivity of 21st century youth. 2001 Pirate Bay = file-sharing website -> 2006 Pirate Party in Sweden and Germany -> 2009 EU parliament elections = 7% in Sweden -> 2011 Berlin elections -> 2011 Czech Senate elections. 2006 Wikileaks = whistle-blowing website -> 2010 Afghanistan and Iraq wars logs -> 2010-2 court cases v. Julian Assange and Bradley Manning -> 2013-4 Edward Snowden’s revelations of NSA surveillance = total information awareness. self-organising majoritarian politics of 99% v. 1% global neo-liberal elite. 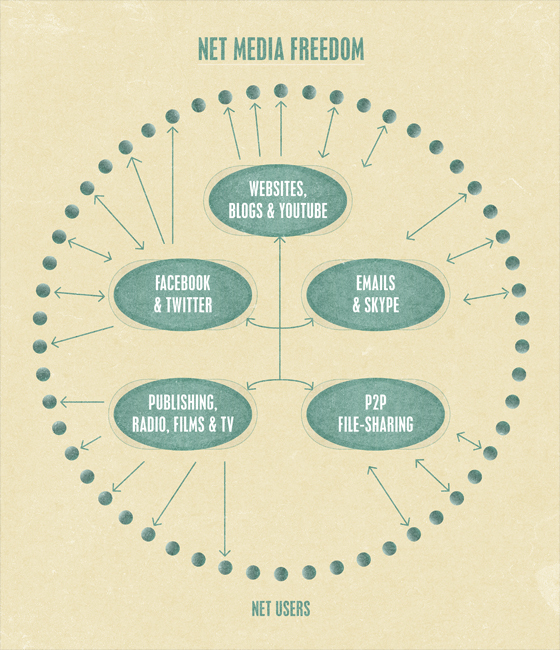 Net media freedom = competitive collaboration of corporations + states + communities. Paolo Gerbaudo, Tweets and the Streets. David Leigh and Luke Harding, Wikileaks: inside Julian Assange’s war on secrecy.